Professor Plock's research focuses on literary modernism and the cultural history of modernity. She has published widely on James Joyce's lifelong interest in medicine and science. Her first monograph Joyce, Medicine, and Modernity was published in 2010 by the University Press of Florida (paperback, 2012) and she has also edited a special issue of the journal James Joyce Quarterly on the subject of Joyce and physiology. Her second major research project took a slightly different approach to the study of literary modernism. 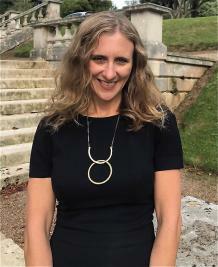 Professor Plock just completed a multi-author monograph, Modernism, Fashion and Interwar Women Writers, that examines the role that fashion played in the works of early twentieth-century women novelists such as Edith Wharton, Virginia Woolf, Jean Rhys, Elizabeth Bowen and Rosamond Lehmann. In this book she argues that these women writers used sartorial tropes to self-consciously comment on their involvement with the literary marketplace of the interwar period. Engaging with the sartorial fashions of their time, Modernism, Fashion and Interwar Women Writers argues, allowed different women writers to respond, at times critically, to market forces and to engage with the literary fashions of their time. A detailed review of the book has been published in Woolf Studies Annual (2018). Currently, Professor Plock is conducting research for a new monograph provisionally entitled Broadcasting to the Enemy: The BBC German Service during the Second World War for which she was awarded a sixteen-month research fellowship from the Leverhulme Trust in March 2017. It will study the contributions made by German-speaking exiled writers such as Alfred Kerr, Thomas and Erika Mann, Walter Rilla, and Martin Esslin to the BBC's German-language programmes during the Second World War. The BBC's insistence on presenting and disseminating a British point of view of the war excluded many German Jews from working as broadcasters for the British radio corporation but they made significant contributions behind the scenes as writers of radio scripts and propaganda programmes. This interdisciplinary project examines these contributions, asking questions about the complex intellectual and national loyalties of these writers, and it also studies the processes of silencing and collaboration structuring their everyday working experiences at the BBC during the Second World War. An article on Erika Mann's work at the BBC German Service has been accepted for publication in modernism/modernity. Professor Plock has also developed a strong interest in the writer Sylvia Townsend Warner, whose work will be the focus of another planned research project. Already in print is Professor Plock's co-edited journal issue on STW that was published by Literature Compass in 2014. Professor Plock's articles have appeared in Modern Fiction Studies, Modernism/Modernity, Journal of Modern Literature, Literature & History, James Joyce Quarterly, Joyce Studies Annual, and Literature Compass. From June 2013 to September 2014 Professor Plock was Principal Investigator of the AHRC-funded research network Tailored Trades: Clothes, Labour and Professional Communities, 1880-1939. Network events included adacemic workshops at Northumbria University and the University of Exeter, public lectures at the Bishopsgate Institute in London, exhibitions in the People's History Museum in Manchester and a concluding network conference "Clothes, Working Lives and Social Change (1880-1939)" in 2014. A recording of Professor Plock's public lecture on Jack London, Slum Tourism and the East End Sweated Industries that she gave in the Bishopsgate Institute in May 2014 can be found on the Tailored Trades network website.